Soybeans are grown primarily for meal, with oil being a secondary product. During processing, the soybeans are cracked to remove the hull and then rolled into full-fat flakes. The rolling process disrupts the oil cells, facilitating extraction of the oil. After the oil has been extracted, the solvent is removed and the flakes are dried, creating defatted soy flakes. Most of the defatted soy flakes are further processed into soybean meal for animal feeding. The flakes can also be ground to produce soy flour, sized to produce soy grits or texturized to produce textured vegetable protein (TVP) for food uses. Further processing can produce high protein food ingredients such as soy protein concentrates and isolated soy protein. These ingredients have functional and nutritional applications in various types of bakery, dairy products, meat products, infant formulas and new generation soy foods. Due to the difference in soybean use, two different types of soybeans have emerged: food beans and oil beans. Soy meal production is primarily used for the feed industry. The main issue in soy meal processing is that the product is incredibly fatty. As a result, the equipment used to process the soy meal requires regular cleaning and maintenance. The main issue with soy flake processing is in grinding the soy into a fine powder. Soy flake is hard to break down because it is high in fiber and the nature of fiber is to bend making it difficult to shear the product. Prater’s Mega Mill Hammermill is used in particle reduction to less than 40 mesh. The Mega Mill is ideal for the application of grinding soy meal because the entire rotor can be removed from the housing of the Mega Mill Hammermill and can be cleaned and ready for processing within 20 minutes. A typical Hammermill would require the removal of each pin and hammer to be cleaned separately. Cleaning the typical Hammermill is a painstaking process. Cleaning typically requires 4-5 hours of labor in addition to an equal amount of production line downtime. Choosing the Mega Mill Hammermill presents a huge savings of both time and money and immediately creates a safer work environment. “M” Series Fine Grinders, designed by Prater, are able to grind dry, free-flowing material down to 200 mesh with extremely tight particle distribution. Prater has engineered advanced technology and has fine tuned the processing procedure, making it ideal for soy flake processing. The “M” Series Fine Grinder makes grinding at various levels of fineness for multiple applications possible with a single pass requiring only a minor processing change. The “M” Series Fine Grinder provides the processor the ultimate flexibility in soy grinding technology. 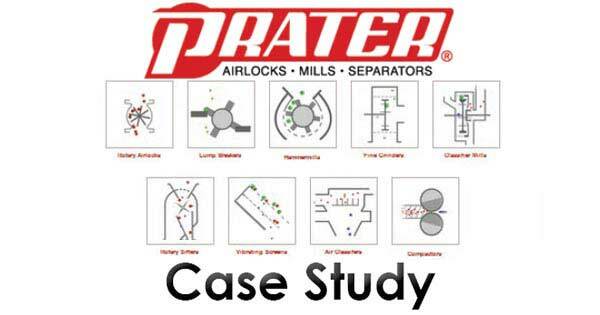 Based on your specific application, Prater will recommend a custom solution for you.